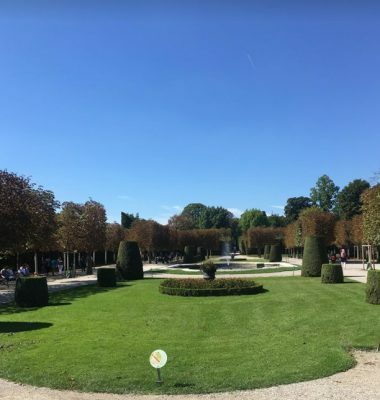 Unfortunately, with the passing of the 23rd of September, summer is officially over and Vienna now begins moving into fall and eventually winter. It has been an amazing few months so far, and I can say that I am completely in love with Vienna. Well, summer Vienna at least; perhaps I will feel different about winter Vienna. Summer Vienna has so much to offer. Growing up in California, I am used to having great summers, but Vienna is unique in the range of activities one can do. If you want to water ski or wake board, there is a place for that. 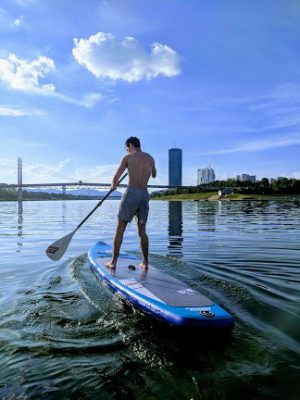 If you want to paddle board, there is a place to rent them. If you want to go hiking, Vienna offers many amazing trails to hike on that go through wineries and forests. All within just a few minutes of the city. During the summer, one can find many people along the Donau river barbequing, sunbathing, and swimming. I’ve never lived in a city where the main river is clean enough for people to actually go swimming in it, and now I couldn’t imagine a city without it. Seeing families and friends picnicking and spending a Sunday afternoon outside together is heartwarming, and really makes one feel a sense of community in Vienna. Though the summer is over for now, I really can’t wait for the next one. In just 3 months I have made a lifetime of memories, and I look forward to sharing food with my friends after work and relaxing by the water. Until then, I’ll have to find out what winter Vienna is all about. This entry was posted in Mein Deutschkurs on 30. September 2018 by Clinton Tak. Cesto cujem u zadnje vrijeme od svojih ‘internacionalnih’ kolega kako je njemacki grozan I tezak za nauciti jezik. Mislim da se ne bih slozila. Potrebno je samo malo vremena I truda I kao sto bi latinska poslovica rekla ‘Repetitio est mater studiorum- Ponavljanje je majka znanja’. Bilo koji jezik bitno je svakodnevno koristiti kako bismo napredovali I kako ne bismo zaboravili ono sto smo do sada vec naucili. Ono sto je super na kursu u Deutschakademie jeste da pored toga sto su (barem moji) ucitelji uvijek veseli I nekako postave se kao da rade s djecom, I sto ta tri sata izdvojena za kurs strogo pricate na njemackom. Ne samo pricate, vjezbate, nego se I igrate ukoliko vas u vrijeme ovih jesenjih dana hvata nostalgija za skolom. Tokom kursa radite dva puta test, tako da cete znati I na cemu ste- u cemu ste dobri a na cemu treba da jos poradite. Kada pomislite da je tesko nemojte odustajati! Zapnite jos vise! This entry was posted in Mein Deutschkurs on 30. September 2018 by Adna Rakic. 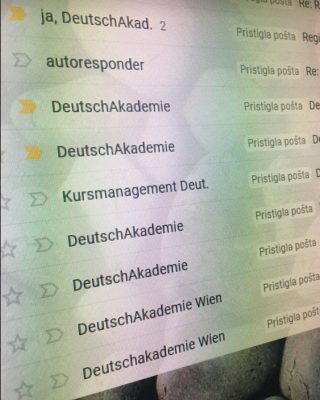 Jucer mi je poceo novi kurs – po redu treci na Deutschakademie I trenutno idem na A 2.2. nivo. 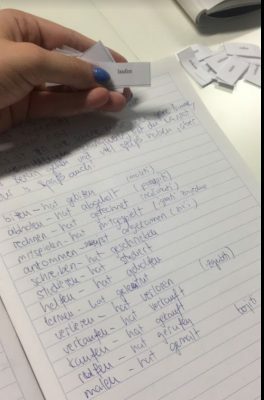 Nisam do sada bila na drugim kursevima osim u Deutschakademie, ali po tome sto vec treci put idem tamo mislim da je jasno da mi se svidja I da nema potrebe za mijenjanjem. 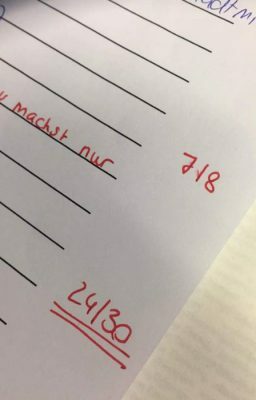 Ono sto mozete pronaci u Deutschakademie jesu prijatni, ljubazni ljudi koji ne samo da jedva cekaju na vas feedback/komentar nego I urade nesto po pitanju toga ukoliko niste zadovoljni. Ono sto mi se narocito svidja jeste to da vam salju vise puta mail-ove cisto da provjere da li je sve uredu, da li imate nekih problema ili poteskoca. Tim Deutschakademie samo tako nastavite, radite odlican posao! This entry was posted in Mein Deutschkurs on 29. September 2018 by Adna Rakic. Bec je nedavno proglasen najboljim mjestom za zivot. Mogu da se slozim. Metro, tramvaj, busevi odlicno povezuju grad, jasan je raspored buseva I ne morate se pitati kada ce naredni doci. To je jako bitno, jer I da ste u Becu vrlo kratak period mozete obici dosta toga. 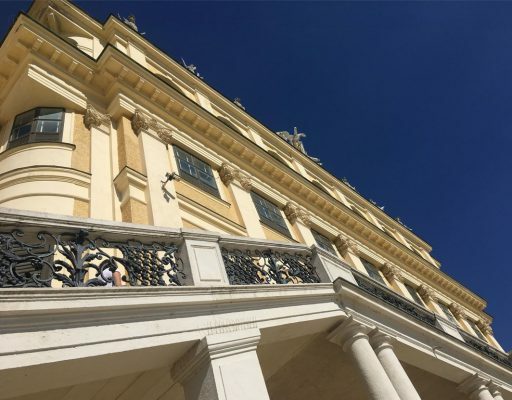 Moje najdraze mjesto u Becu je Schönbrunn Palace. Mjesto je jednostavno prelijepo-divna arhitektura, dosta zelenila I cvijeca. Do iduceg javljanja, a ispod cete naci jos slika mog nadrzeg mjesta u Becu. 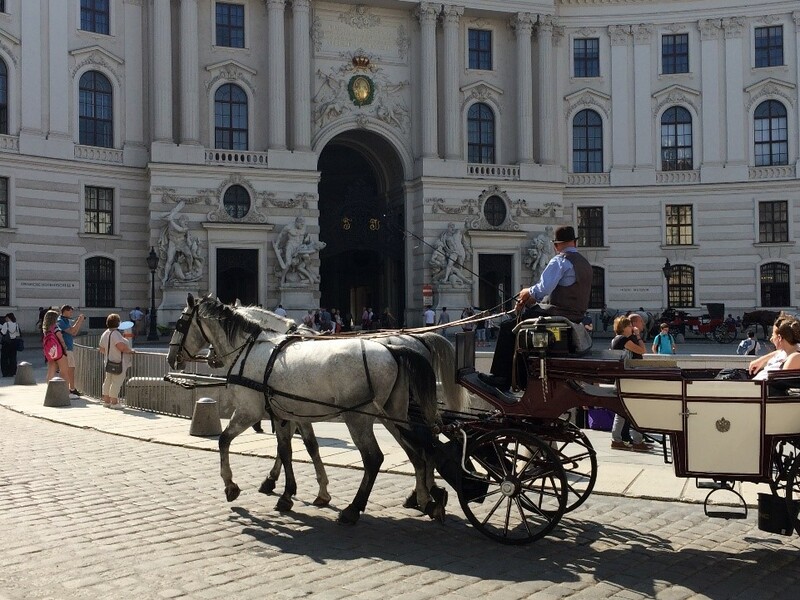 No matter what time of year it is, no matter the weather, a constant sight to behold on the streets of Wien are the many Fiaker, or horse-drawn carriages. These are as Viennese as the Oper and an integral part of the old customs of the Viennese culture. In the dusk of evenings, one almost expects to encounter a gas-man out of the shadows, going around lighting the gas-lamps as one would expect in the hey-day of horse-drawn transportation – the gate-way into another age! The word ‘Fiaker’ itself is derived from Rue de Saint Fiacre in Paris, named for the Irish patron saint Fiachre, the location where what can be considered the first commercial horse-taxis began. 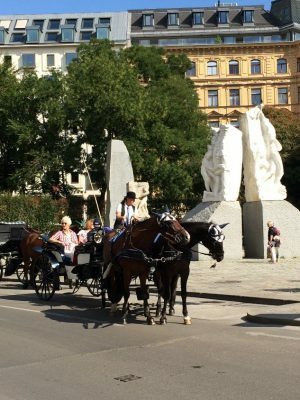 According to the official website of the Fiaker club, there are approximately 100 such teams of horses and coachmen available for hire across the city: either for the tourist-tour or occasionally, festively decked-out for a wedding party. It can be easy to dismiss the offer of a horse-drawn carriage ride as nothing more than a cheesy, tourist-driven attraction, but the fact is that the horse was an essential mode of transportation for millennia, the skills of which were highly valued. Horsemanship was a highly accomplished trade, one which was handed down from generation to generation. It was only after the Second World War that the popularity of the horse-drawn transportation dropped dramatically, as automobiles took off as the new mode of transportation. Today, one will still find that the vast majority of Fiaker teams are family businesses, passed from father to son (or daughter!) through the decades and given the time-period of which they were born, most of the carriages are over 100 years old. This makes a ride in a Fiaker quite special: it is not merely a service, as one might expect in a journey by taxi, but a direct means of contact with people who made the city what it is through their interaction with the public and their participation in forming the city landscape. Many of these cab-drivers are characters, which is evidenced by their wild storytelling and love for embellishment of the truth! They are also a font of knowledge of the city itself, knowing every nook and cranny like the back of their hand… and we can be certain that their horses are in the same boat! 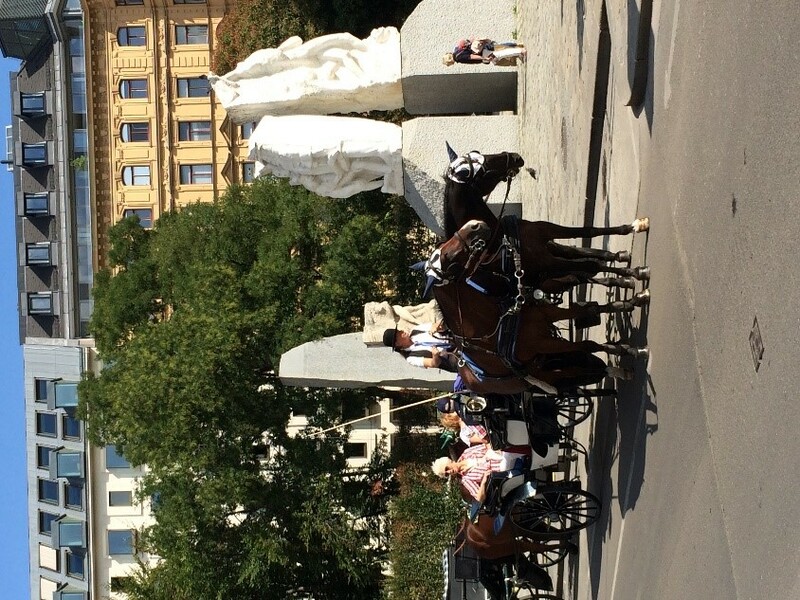 There are a number of regulations in place today which means the horses and divers are secured certain allowances: where they can park to pick up fares; the number of hours the animals may work in any one week; the weather conditions they may operate under; even the traditional costume of the cab-driver is now a protected requirement in order to secure a Fiaker licence in Wien. The sight of the jauntily dressed driver with his polished carriage and the gleaming coats of his horses is a welcome sight whatever the season, enlivening the classical streets of the city and reminding us of slower times, where life was not so hectic and horses were man’s best friend and a very essential part of daily life. If you haven’t the time to actually enjoy a jaunt in a little piece of history, at least take a moment or two the next time you see a team drive past, to admire the care and attention, the history and tradition which is neatly wrapped up on four wheels and sixteen hooves! 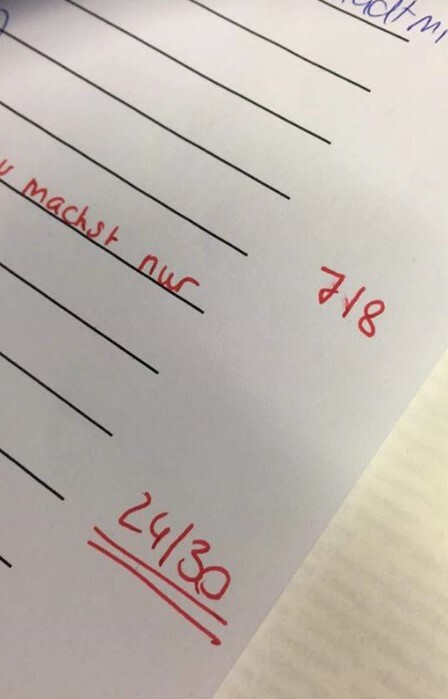 This entry was posted in Mein Deutschkurs on 28. September 2018 by Aoífe-Maria Beglin. Na prvom kursu sam upoznala jednog pravo zanimljivog I pametnog momka. On dolazi iz Ukrajine. Bavi se matematikom I fizikom (kao sto rekoh, prava pametnica). Druzili smo se tih prvih mjesec dana, poslije smo se sretali samo onako usput s obzirom da sam ja nastavila intenzivnim a on polu-intenzivnim kursem. Pisajuci o njemu navelo me na razmisljanje da bih ga trebala zvati na pice. Nikad ne znate koga mozete upoznati, mozda upravo na kursu upoznate svoju srodnu dusu (ne mora biti u ljubavnom smislu, moze to biti I prijateljica/prijatelj da naglasim :P). This entry was posted in Mein Deutschkurs on 28. September 2018 by Adna Rakic. WWMD (What Would Mozart Do)? Do you know who he is and what his lifestyle preferences are? No, well not to worry, for the city of Wien will illuminate your ignorance and set you right in the error or your ways. For though he was born in Salzburg, Wien has claimed him as one of their own and his image is to be found plastered on everything from mugs and maps, clothing and chocolate, to posters and pillboxes. He is inescapable and ever-present, watching his adopted city go by, some 261 years after his birth. 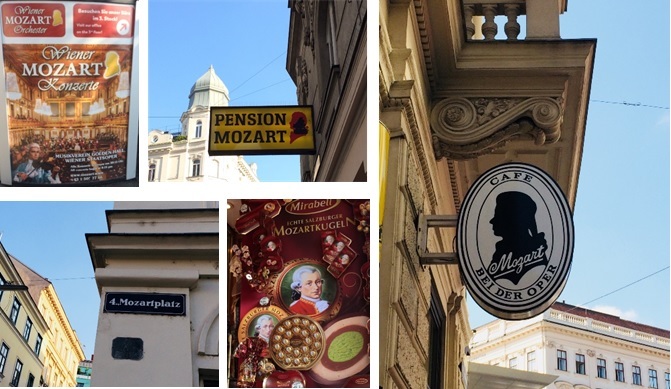 During your vacation in Wien, you can stroll down Mozartgasse or saunter across Mozartplatz; you can drink a Mozartkaffee at Mozart Café or enjoy a Mozarteis. You can listen to Mozart’s music whilst attending any one of the numerous performances of his works by the Mozartorchester and if you are really lucky, you can see Mozart himself – or at least one of his fifty Doppelgängers – resplendent in glitzy, gaudy finery to be found on any given day within a 50m radius of Stephansdom. The big famous numbers of his vast repertoire are trotted out with predictable and repetitious regularity for advertisements on television and radio. 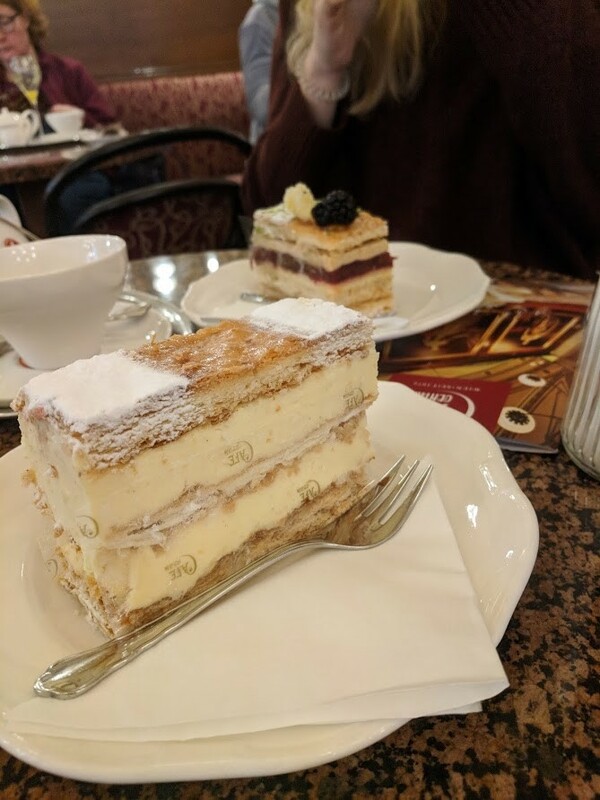 And then of course there is the opportunity on every street corner, in every supermarket to indulge in a sweet treat with the obiquitious Mozartkugel. 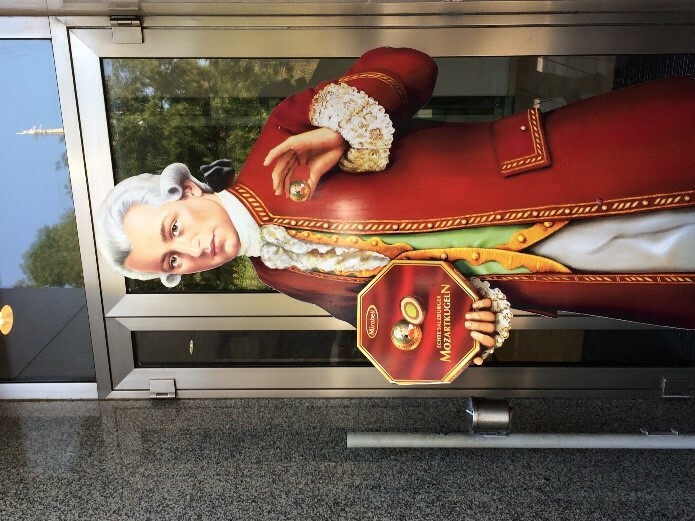 Even Mozartkugeln have their own Doppelgängers, with about ten different manufacturers all vying for a piece of the Mozart action. As the old saying goes “familiarity breeds contempt” and through all this, it seems to me a terrible pity that it is too easy to become indifferent to his prodigious contribution to the world of music and the classical arts. And he certainly was a prodigy. Wolfgang Amadeus Mozart was born in Salzburg in 1756; lived in Wien from 1781 to 1788; died in 1791, aged only 35 and in the span of his short life composed over 600 pieces of music, most of them vast multi-instrumental works for orchestra. Born into a musical family, under the instruction of his father Mozart began playing the piano aged three and began composing aged five. From the very outset he displayed an incredible ability to remember, replicate and expound upon incredibly complex melodies, which he would only have to hear once before being able to play perfectly and it was this gift which helped him rapidly develop his own style. At six years of age, he was already on tour with his family around Europe, entertaining royal courts and learning from composers such as Bach and Hyden. He wrote his first three symphonies aged 8 years of age and by the grand old age of 17 he was installed as the official court musician in Salzburg. However his good fortunes did not last long and after a dispute with the Kappelmeister in Salzburg, he resigned his post, moving to Wien in 1781. This move heralded the beginning of Mozart’s financial troubles, which ultimately contributed to his untimely death in 1791. 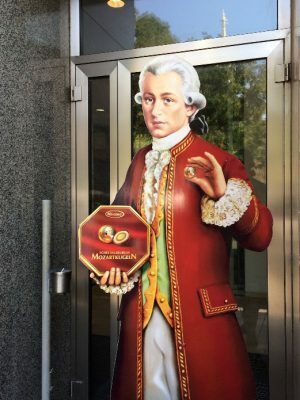 In Wien, Mozart achieved significant fame through his fantastical compositions but yet this admiration was not enough for him to gain secure employment. Writing private commissions helped keep Mozart afloat, but these were not enough to sustain the composer and his family, who was by this time now married to Constance Weber, with whom he had six children (though only two survived infancy). These difficulties were not helped by the political climate at the time, now by the large amount of personal debts which the family had managed to accrue. Near the end of his life, it can be said that this situation was beginning to turn around as Mozart experienced a very fruitful creative period and he was composing right up until his death, with the last work he wrote being his beautiful and famous Requiem: composed for an unknown patron, upon which many speculate that Mozart actually composed it for his own impending death. Mozart’s legacy is a vast collection of musical treasures: concertos, symphonies, operas, choral music and any number of trifling compositions, just for fun. His music has the uncanny ability to look and sound very simple, whilst actually being very demanding to play. This entry was posted in Mein Deutschkurs on 27. September 2018 by Aoífe-Maria Beglin. Zasto bas njemacki? Pa mislim da je odgovor jasan za sve evropljane. Pored engleskog, mislim da je njemacki najzastupljeniji I najkorisniji jezik u evropi (dragi moji prijatelji francuzi ako ikad ovo budete citali, nemojte se ljutiti). Jednostavno se vidim u njemackom govornom podrucju u buducnosti. Smatram da se dom moze izgraditi bilo gdje a ne tamo gdje si rodjen, ides tamo gdje ti je lijepo. Smatram da ako vec zivimo u ‘necijoj drugoj drzavi’ onda bi bilo lijepo da se I integrisemo u istoj, a kako to uraditi nego nauciti njihov jezik. Strani jezici su uvijek dobra investicija u sebe! 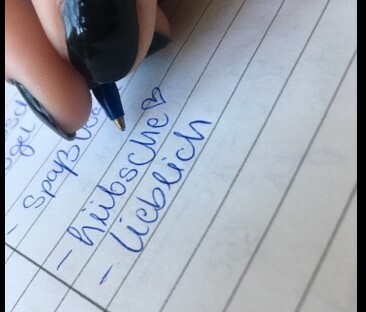 This entry was posted in Mein Deutschkurs on 27. September 2018 by Adna Rakic. Anytime I find myself in the vicinity of Mariahilfestrasse/Naschmarkt whereby I must traverse Girardigasse, it never fails to bring a smile to my face when I am reminded of the similarity between the spelling of the street-name and Giardia lamblia, a parasite which causes intestinal infections, the most common gastrointestinal disease-causing parasitic agent globally. As a microbiologist by training, I am very familiar with Giradia and its lifecycle, the effects which range from acute inconvenience to chronic infection, and for which the successful treatment requires scrupulous standards of hygiene. In this vein, I am led to recall the life-story of one Dr. Ignatz Semmelweis, his involvement in germ-theory and the beginnings of standardised hygiene and sanitation practices in European hospitals. Dr. Semmelweis (1818-1865), a Hungarian by birth, studied medicine in the University of Vienna in the 1830s where he specialised in obstetrics. In 1846, not long after graduating as a doctor, he found himself based in the Vienna General Hospital, where he was placed in charge of two obstetrical clinics: the First Clinic and Second Clinic. It was in his role there that he encountered a medical mystery which baffled him and which he dedicated his life to solving. Though these two clinics were operating under almost the exact same standards in the same hospital, the former had a mortality rate of approximately three times that of the second. One of the most-feared causes of death was the so-called ‘childbirth fever’ (puerperal fever), which was commonly contracted by women who had just given birth and for which nothing could be done. So great was this fear, that often women in Vienna would often rather give birth on the streets than to enter the feared First Clinic. It should be kept in mind that at this point in history, medicine was very far removed from what we understand it to be today and the knowledge of doctors regarding the causes of diseases was extremely limited. The fact that large numbers of patients were dying under his care greatly distressed Dr. Semmelweis and he began to systematically rearrange practices in the units, eliminating factors in an attempt to discover what was the root cause of the fatalities. Some light was eventually shed on the mystey when a colleague of Dr. Semmelweis’s died after being cut with the scapel used in an autopsy of a patient who herself had died from puerperal fever. Examining the evidence of the autopsy proved that the fatal agents were the same in both cases. During this time, the Second Clinic was staffed only by midwives, whilst doctors were the only ones working in the First Clinic. Taking into account the fact that doctors were also the only ones carrying out autopsies, Dr. Semmelweis therefore concluded that the fatal agents were being transferred through the doctors from the corpses to the living. He named these discoveries ‘cadaverous particles’ and immediately instigated a new hand-washing scheme, requiring that all staff must wash their hands in a chlorine solution before attending to new patients. The new scheme was an instant success and the mortality rates in both clinics fell dramatically. Sadly, however his theories were rejected entirely by his fellow doctors in the medical profession who resented the insinuation that they themselves were somehow involved in the transmission of disease. After losing his job as a result of being discredited, Dr. Semmelweis sank into depression and was committed to a mental asylum. Tragically, just 14 days after his admittance, he died as a result of being beaten by the wardens in the institution. He was only 47. 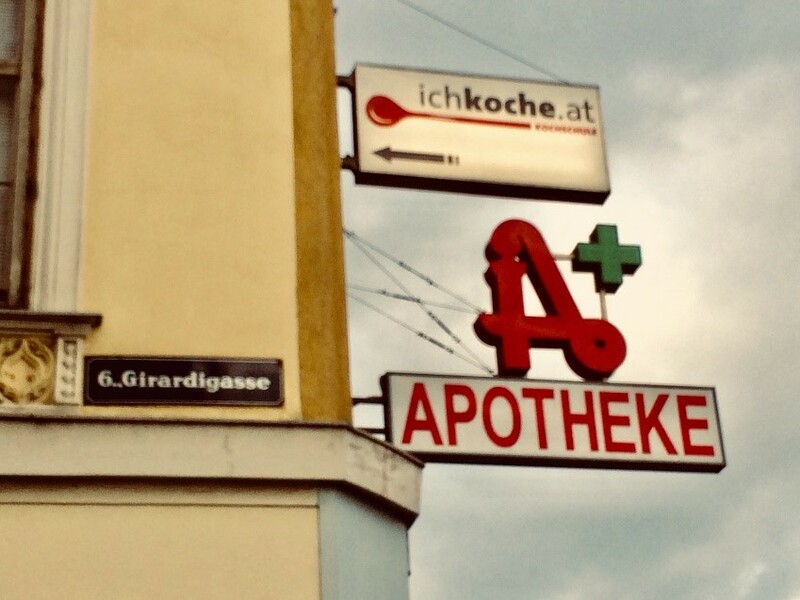 A mere nineteen years later, Robert Koch formulated his famed ‘Koch’s Postulates’ theory and the acceptance of germ-theory and disease transmission became standard, along with basic notions of hygiene and sanitary practices in all hospitals. Today, good hygiene and standardised sanitary practices are something which are practiced not only in hospitals, but in every sphere of life. Even advanced clean-room technologies are founded upon these basic findings of germ-theory of which Dr. Semmelweis was a cornersone. So the next time you wash your hands before a meal, enjoy the privilege of clean water or attend to your sick sibling, think on Dr. Semmelweis and give thanks for his life’s work which has helped us lead longer and healthier lives. 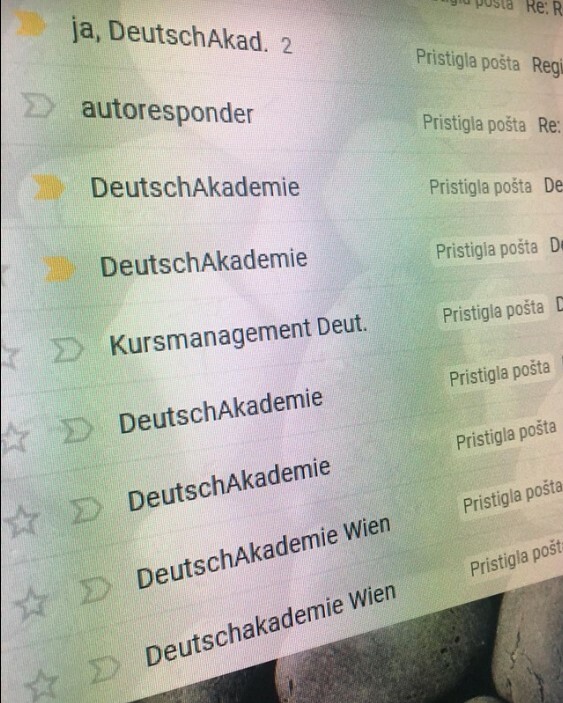 Ovaj put cu vam pisati o svom prvom danu u Deutscheakademie. Moja ‘uciteljica’ je bila Lisa. Kada sam je prvi put vidjela nisam bas bila sigurna kako da se osjecam jer sam uvijek ocekivala nekoga dosta starijeg a Lisa je bila mojih godina. Do kraja prvog dana vec sam je zavoljela, ljubazna, simpaticna I strogo komunikacija na njemackom to mi se bas svidjelo! Cak I kada je nismo uspjevali razumijeti objasnjavala nam je rukama I nogama, ali strogo njemacki. Sto je po mom misljenju odlicno I produktivno – tri sata pricanja I razmisljanja na njemackom. Prvi dan je bio bas kao prvi dan prvog razreda skole-uzbudljiv. This entry was posted in Mein Deutschkurs on 26. September 2018 by Adna Rakic. So I’m just going to come out and say something personal about myself that I don’t usually tell people: I don’t really like desserts that much. Yes, you read that correctly. No, I’m not talking about the Sahara Desert, or the Kalahari Desert, or the entire country of Australia. I’m talking about cake. For some reason, my whole life, I have always just enjoyed savory more than sweet, burgers more than pastries, and fried rice more than just about anything else. 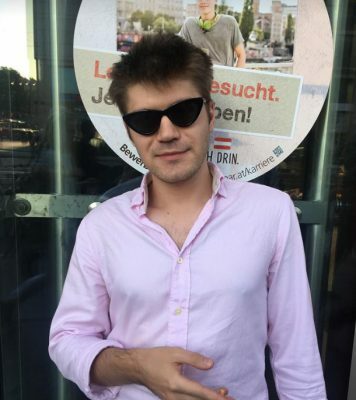 But that all changed one day when I came to Vienna. I had heard a lot about Viennese pastries and desserts and, unlike me, my girlfriend is a normal person who really enjoys a good pastry, so we decided to head to Café Central, one of the many famous Viennese Cafes with an illustrious history of serving great desserts to great people (Sigmund Freud and Leon Trotsky were notable patrons of this particular establishment). 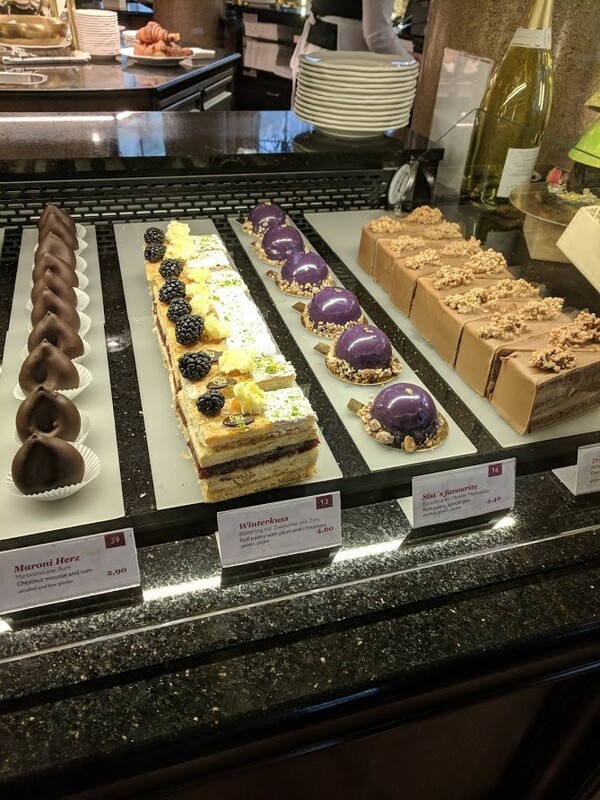 After browsing their collection of eye catching and beautifully appointed cakes and pastries my girlfriend and I selected a few, took the necessary photos that food of this caliber deserves, and set upon them with all the careful ferocity we could muster. What followed next was absolute bliss. I have never in my life been so enamored by a sweet tasting food. Everything was just so damn good. The flakey pastry fell apart perfectly and provided the perfect texture to balance out the soft cream filling. The various jams and fruits tasted perfectly fresh and didn’t overpower the taste of the rest of the dessert. All in all, it was one of the most memorable food related experience of my entire life. Since then, I have thought often about the amazing cakes and desserts that can be found in Vienna. 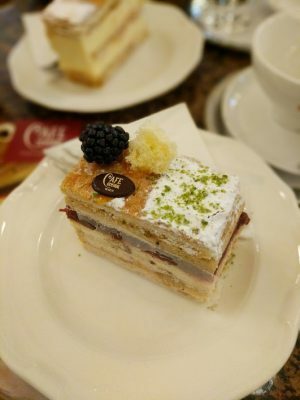 I haven’t been back to Café Central since, but I have gone to Café Demel, and Café Sacher, neither of which have disappointed me. Next on my list is Joseph Brot vom Pheinsten, where I am told one can find the best bread in the world. If it lives up to the reputation of eating establishments in Vienna, I am sure it will be an unforgettable experience. This entry was posted in Mein Deutschkurs on 26. September 2018 by Clinton Tak.